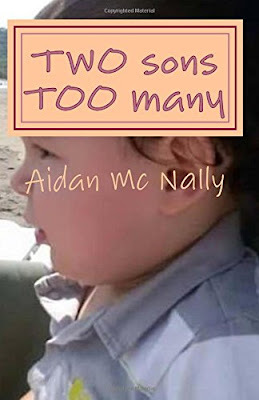 Today, I am going to introduce you to Aidan Mc Nally and his newly self-published book, TWO sons TOO many. Our featured author today is from Loughshinny, Dublin, Ireland. I don't think I've ever featured an author on my blog before, but there's a first for everything. Also, this is not a paid post. Book cover of "TWO sons TOO many." Photo Source here. Aidan is a friend and I'm quite excited that he is now a published author. Fortunately he agreed to answer some of my questions about his book and his writing process. * For 20 years, I have travelled the world as a commercial fisherman. From the Irish Sea, where it all began, to the Celtic Sea, which is south of Ireland, and the big bad Atlantic Ocean, the west coast of Ireland. It is this that carried me to Alaska and the Bering Sea. Life as a fisherman is one of the greatest ways to connect with mother nature in all the true forms - from watching an electric storm sweep across the open ocean at night to riding high waves taller than buildings. The nature experience is outstanding and the oceans of the world are full of life. The Pacific Ocean and the deep sea are all large part of me and my existence, that maybe not many people could ever know or even guess. * I wrote my life story on paper for the purpose of reading it back and see if it was all real or not; it has become unbelievable, even to me. 3. Million dollar question, are you working on another book? * I am currently re arranging "TWO sons TOO many," by chapters as the next book will include some elaboration into greater depths. 4. Do you still write? If so, what does your typical day look like? * A typical day? Hmm...well first off, check and see how much twitter activity is there, then play around and get lost in the internet, FB, twitter, etc. Then some thoughts and writing happens as a day to day thing. Then more computer, squeeze in some food, more scribble, daydreaming, and watching news updates on social media. 5. What is your writing style? * Writing style, this is something I would have to leave up to the reader. Style or category is hard for me to say. The bottom line is that "TWO sons TOO many" brings real RAW life to the reader where many never discuss such issues and so could identify in private. 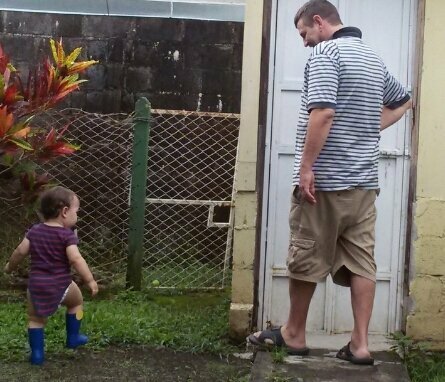 Aidan and son. Photo courtesy of Aidan. 6. What tactics do you have when writing? * Writing tactics would be, write it out as it comes to mind, read it back, continue. I would say the simplest explanation would be, having a conversation with myself but my conversation answers are through pen. 7. What is your book about? * "TWO sons TOO many" is about my life and it covers many areas of life that our population today may have never experienced, to be short "many have dreamed to experience or fear to never experience." So some may identify but many could never even imagine. Truth and honesty are so important. 8. Does your book have a lesson? Moral? * Lessons and morals of the story are many and deep- to never give up, continue, overcome and adapt. However due to my many experiences explained throughout my memoir, the lesson may just be - Anything can happen at anytime. 9. What is your favorite part of the book? * The last page, I cannot believe I managed to get it all out of me, concise it down and see it in a book. It lifts me up so much. 10. Where can readers find your book? * My book can be found here (this is the self published paperback e-store site). Can also be easily downloaded from Kindle or from other online retailers such as Amazon.com or Barnes&Noble.com . Hopefully with a little more exposure and coverage we can reach the bookstore shelves soon. If you'd like to get to know more about Aidan, he blogs here. I do hope that Aidan's interview will piqued your curiosity to check out his book. And if you have questions for him, do leave a comment and get a chance to win his book. Optional but if possible please share this post on Twitter, Facebook etc. Leave a link where you've shared it. Giveaway ends on Friday, August 19, at 12:00 AM (ET). The winner will be randomly selected via list randomizer. One winner will win a copy (Kindle or hardcopy - winner's choice) of Aidan's book. Congratulations to your friend on his published book. It sounds like he's lived a very full life. How incredible to know and be friends with an author. That's one of my fantasies, LOL. There used to be a guy in our church that was in process of writing a novel, but Idk what happened to him. I have to say that it's pretty cool to have a friend who wrote a book. I've been wanting to write a book msyelf...lol. Maybe that guy from church did finally get his book done.